CREODIAS data repository contains full data sets (time and spatial coverage) of Sentinel 2, 3 and 5P, ESA/Landsat and Envisat/Meris, Sentinel 1 GRD and partial – covering Europe – repository of Sentinel 1 SLC with 6 months’ worth of SLC data of the whole Earth. Additionally, historical archives of Landsat 5, 7 and 8 products are available within the platform. All Earth Observation products, which will grow beyond 20 PB of data, are online, accessible immediately without downloading. 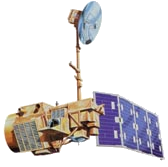 Landsat 5 was a low Earth orbit satellite launched on March 1, 1984 to collect imagery of the surface of Earth. The mission neded on June 5, 2013. The mission used a multispectral sensor (Thematic Mapper (TM)) that recorded in 7 spectral bands using the range of visible light, near and thermal infrared.